Brasilian Vibes Trio members are Arthur Lipner (vibes & marimba), Nanny Assis (guitar/vocals/perc) and Leonardo Lucini (7-string elec bass). Lipner and Assis have been performing together for almost 10 years. Engagements have included NYC’s famed Blue Note (August ‘17), KOSA (Montreal), Slyfest 2017 Festival (NY), Pompano Jazz Festival (FL) and Levitt Pavilion (CT). Their album “Brasilian Vibes” was nominated “Best CD of the year” by the Brasilian Press Awards. In 2017 the same organization awarded Assis “Best Brazilian Vocalist in USA” – for the second time in his career. Lipner’s concert appearances, recordings, and publications have established him as a leading mallet player and composer of his generation. 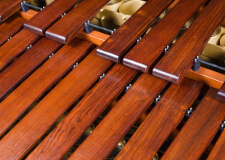 This ground-breaking trio integrates mallets and percussion with varied Brazilian styles and repertoire to create exciting new sounds which will tap your feet and your ears. Assis is from Bahia, and Lucini from Rio de Janeiro. Lipner has toured in Brazil eighteen times.